(Nanowerk News) Biocompatible materials that emulate living tissues can be used for tissue repair and regeneration. Polymer scaffolds, for example, mimic the network that connects cells and stimulates cell adhesion. They can also transport various cell types. Now, stem cells differentiated into liver-like cells from bone marrow stem cells can be delivered to the liver using a fibrous polymer scaffold containing the peptide RGD, thanks to a technique developed by a team led by Andrew Wan at the Institute of Bioengineering and Nanotechnology (IBN) of A*STAR, Singapore ("The use of a polyelectrolyte fibrous scaffold to deliver differentiated hMSCs to the liver"). To differentiate the stem cells, the researchers first cultured human liver cells in Petri dishes to form a cell layer covering the entire dish surface. Then, they added an ammonia solution to destroy the cultured cells while leaving intact the surrounding matrix, also called extracellular matrix (ECM). Finally, they placed the stem cells in the ECM-coated dishes and cultured them for one month to effectively induce their differentiation. By monitoring the differentiation, Wan and his co-workers found that the differentiated cells produced albumin and converted ammonium salt into urea, which are functions unique to liver cells. They observed that the amounts of the two substances increased upon cell maturation. “In a preliminary experiment, we discovered that the RGD-modified scaffolds were able to support stem cell adhesion as well as, if not better than, ECM-incorporated scaffolds,” says Wan. When testing the ability of the polymer scaffold to support cell growth and proliferation in vitro, the researchers observed that the differentiated cells adhered to the scaffold surface and penetrated its fibrous structure. After implanting the scaffold-embedded cells into a rat liver from which a portion had been removed, they discovered that the cells remained attached to the liver without migrating (Fig. 1). They also found that the transplanted cells secreted albumin and stored glycogen like native liver tissue. The differentiated cells exhibited some markers specific to native liver cells, but at lower levels. 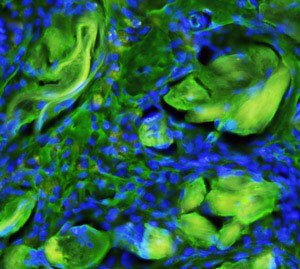 “To achieve the ultimate objective of engineering fully functioning liver tissue, we would need to improve the liver-specific function of our differentiated stem cells as well as the scaffold structure,” says Wan. The researchers are currently investigating new approaches to achieve this goal. The A*STAR affiliated authors in this highlight are from the Institute of Bioengineering and Nanotechnology.